The Madidas Make History As The First Male And Female Celebs On The Glamour Magazine Cover. 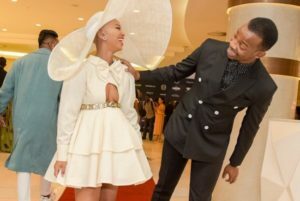 Nandi Madida and her husband Zakes Bantwini are definitely the ones to keep an eye on this year. The gorgeous couple has just made history as the first male and female to be on the cover of Glamour Magazine. The Madidas have many reasons to celebrate this year. Their expecting their second bundle of joy in less than 2 months time. Congratulations on the pair, as they start the year with a bang. Honoured to know we made history for @Glamour_SA, with this being their first cover having both a male and female celebrity on it. It’s fitting as this year not only will we be bringing new life on this earth (in less than 2 months ), but also bringing new life to some incredible projects aswell. So much to celebrate in 2019! Looking forward to traveling around the world with my clan and do it with my best friend @Zakesbantwini . Here’s to celebrating LOVE and a LEGACY. Congrats @Asandasizani look at this! The post The Madidas Make History As The First Male And Female Celebs On The Glamour Magazine Cover appeared first on Youth Village.